Well after two days in a row of Max skipping his nap (and then being exhausted and cranky), he finally took an afternoon snooze yesterday, yippee!! This anti-nap sentiment has been in addition to him fighting bedtime, putting-on-clothes time and getting-in-the-carseat time ... we must be getting close to two years old! 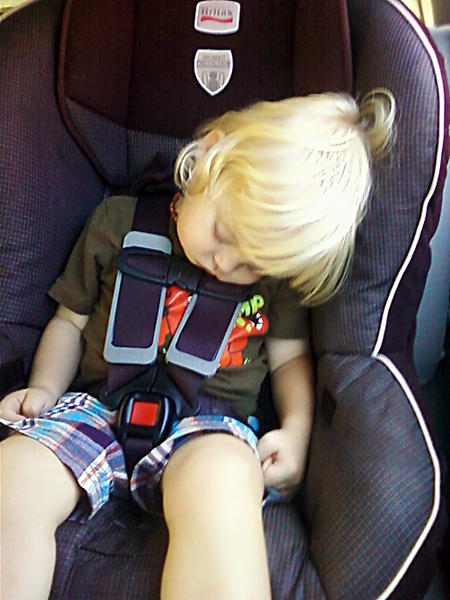 Here's Max one day last week ... after he refused his nap, I drove around town until he finally fell asleep! Anyway, I was so relieved that Max consented to a nap yesterday that I felt inspired to write a little poetry. I was inspired by Dr. Seuss and the book we read before his nap, The Cat in the Hat! That Max is finally napping for me? And we played lots of games. And read books in the dark. And his crackers with a crunch. And made his dinos say RAWR!